Moving with your pets is extremely stressful. But with these tips your move will go a lot smoother. Moving day can be extremely stressful for your pets as they transition from your old home to your new apartment. But there are some ways you can help your pets make to move without completely stressing them out. Check out three more of our favorite tips for moving with your pets. Just as you pack some of the important things for you and the member of your family, it is also important for you to pack a box for your pets. Packing a box full of medications, treats, several days’ worth of food, their pet, a leash, and some toys. These items will help your pet adjust to their new surroundings will and allow you to set up the home before worrying about going shopping for new pet food or wondering where the food is stashed in your moving boxes. Anyone who has ever had a stressed pet before knows they are likely to run when terrified. Cats tend to bolt under furniture while dogs will run out an open door. So how do you keep them from running away? 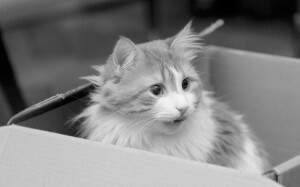 If your pets are staying with you on moving day, keep them confined in one room of your old and new apartment. Putting up a side will alert the movers that your pets are in the room and it should be opened. If your pets aren’t confined they may get underfoot and hurt. They could also easily escape through an open door, leading to your panic and them being lost. Once all of the furniture has moved, carefully take your pet to the new apartment and put them inside one of the rooms. This room will be a haven for your pet so make sure to put out food, water, and toys for them to enjoy while you finish moving. Once things have settled down a bit, introduce them to the rest of the apartment over the next few days. Just like you, it is important for your pets to have a structured routine. Although moving is stressful, that does not mean you should skip walks or feeding times with your pets. Keeping the same routine as much as possible will help your pets adjust to their new life at Harborside Village Apartments! Moving with Your Pets with Harborside Village Apartments! This entry was posted on Friday, May 6th, 2016	at 8:19 pm	. Both comments and pings are currently closed.